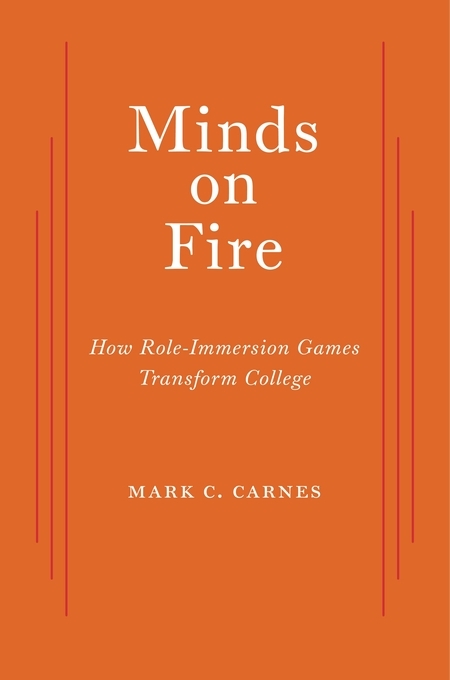 Review: Mark C. Carnes, Minds on Fire: How Role-Immersion Games Transform College (Cambridge: Harvard University Press, 2014). 371pp + index. $27.95. This volume is partly about the shortcomings of traditional university pedagogy. It is partly about the value of educational games. For the most part, however, it is about the Reacting to the Past series of historical educational role-play games first developed by Carnes and now by a growing number of other educators associated with the Reacting Consortium. The Reacting series includes classroom-ready role-play material for historical and philosophical debates ranging from the restoration of Athenian democracy through to the French revolution, religious debates in Puritan New England, to the independence of India—and much more. 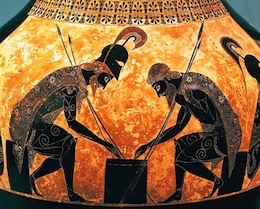 Although Carnes’ book devotes only very limited attention to other educational game use, and says equally little about their use outside of history and general humanities courses, it is nonetheless a very lively, deeply thoughtful, and powerful argument for the use of such games in the classroom. Carnes asserts that role-playing games like the Reacting series sharpen critical thinking; develop writing, presentation, and other skills; and engage students in a way that lectures and readings are often unable to do. Central to his argument is the notion of “subversive play”—that is, playful activities which offer the possibility of upsetting the familiar order. Much of student life, Carnes suggests, has long revolved around joyful engagement in such subversive play, whether through sports competition, video games that immerse the player in fictional and unfamiliar worlds, satirical and “disrespectful” attitudes to authority, or norm-defying social activities (such as parties, drugs, and drinking). Role-immersion games, he suggests, tap into this quite natural human fondness for competition and challenging the established order by enabling students to adopt new personae, struggle to convince others, and thereby seek to change the course of a re-imagined history-in-the-classroom. The author is able to cite significant research that shows the benefits of the Reacting approach. At times, however, the book’s unapologetic enthusiasm for immersive role-playing means that some potential drawbacks of serious games are glossed over. Most research on educational gaming more broadly shows its benefits are often highly variable or relatively limited. Indeed, because of this, some dispute resolution scholars have even questioned whether role-play negotiations are really an effective pedagogical tool. Much depends on the game being used, the skills of the instructor/facilitator, and the manner in which it is integrated into broader curriculum. There are substantial opportunity costs to consider: time spent role-playing is time taken away from delivering material through lectures or other techniques. There are also practical constraints—for example, those presented by large classes. Many Reacting-type immersive role-plays take place in medium or smaller classes over several weeks, a luxury not all instructors may have. Nonetheless, I enjoyed the book a great deal. Carnes manages to anchor his discussion in a considered critique of traditional educational approach, while making effective use of vignettes, interviews with former participants, and scholarly research to make his points. His enthusiasm is infectious. Even if this book is largely arises from the author’s particular experiences with Reacting to the Past, its value extends well past this to make a substantial contribution to broader debates on contemporary university education. Thanks for this. I’ve used Reacting to the Past in many of my courses, and with a great deal of success (even among non-majors). I have used Reacting in classes at a community college and the most frequent comment from my students is that they learn and remember so much more through these games than they do through traditional lecture. One student recently commented that they were surprised at how many ‘life skills’ they were learning.